Dr. Amit Goffer, Founder of Argo Medical Technologies, has embarked on a quest to change the way the world thinks of ambulatory aids. The inventor, who himself became a quadriplegic after an ATV accident in 1997, has been tinkering with the ambulatory device’s schematics on various levels for years. 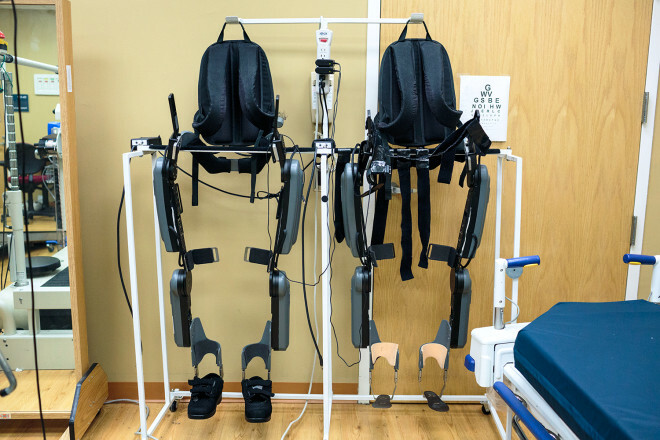 The project — which hopes to enable those suffering from spinal cord injuries to walk upright once again — saw its first test runs in Goffer’s garage in 2004 and eventually reached clinical trials by 2006. Just this June, ReWalk became FDA approved. The ReWalk is the first exoskeleton to be approved by the government regulatory organization for personal use. While the device does carry a hefty $70,00 price tag, the benefits that it can provide the wearer are priceless. Though, Argo CEO Larry Jasinski hopes to convince insurance companies to cover the costs of the ReWalk in the future, as the positive gains of the device are innumerable. As Wired’s Issie Lapowsky points out, most of today’s basic wheelchair design is the same as it was when it was drawn on ancient Chinese vases centuries ago. By strapping braces to a user’s legs and using computers and motion sensors to control movements, ReWalk aspires to revolutionize the outdated market. Gene Laureano, an Army veteran, has been paralyzed since 2001 and often works with Argo Medical Technologies to demonstrate the benefits of the ReWalk. Having regained his mobility thanks to the ReWalk, he happily posits the question to Wired, “Does it get any better?” The motorized device uses two crutches and an electronically aided leg system to help paraplegics prove those wrong who told them they would never walk again. Dr. Ann Spungen, an initial skeptic of the ReWalk, has also endorsed the widespread adoption of the device. Dr. Spungen is the Associate Director of the National Center of Excellence for the Medical Consequences of Spinal Cord Injury at the James J. Peters Center. There are 6 ReWalk units at the Center responsible for getting 14 paraplegic patients back on their feet. She has noticed sweeping improvements from her patients that use the ReWalk, whether they gain muscle or simply have an improved self-image. ReWalk is designed for a top speed of about 1.3 miles per hour, fast enough to make it safely across an intersection before the light changes. Moving forward, Dr. Spungen thinks the 3 mile per hour speed of the ReWalk should be heightened, as a conventional wheelchair is still much faster. 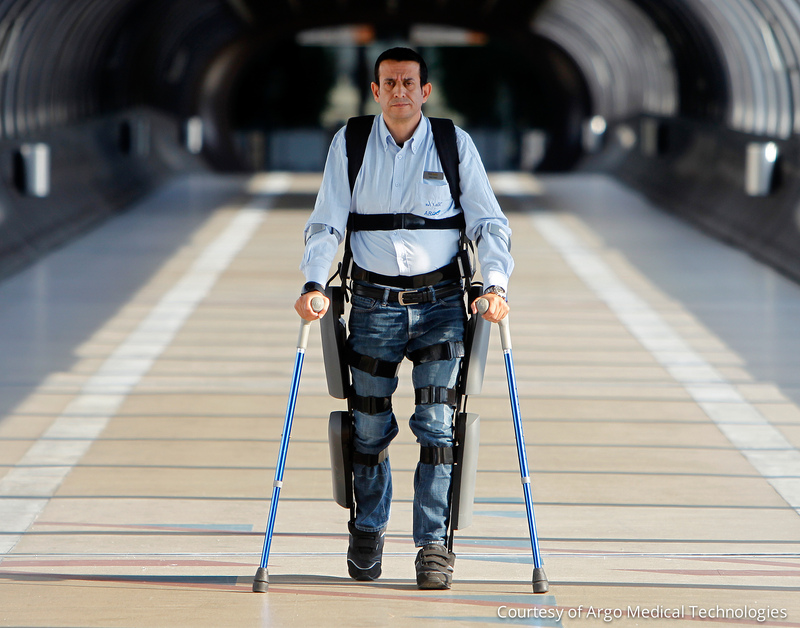 In all, the fact that an exoskeleton has been approved for personal use may shift the path medical technology takes in the future. Since Dr. Goffer and Argo have proven the benefits of this kind of design, the possibilities for medical aid are seemingly endless. Dr. Goffer, a quadriplegic himself, cannot reap the benefits of his own invention… just yet. “My time will come, I’m patient enough for that,” he says. This entry was posted in Design Trends, Maker Movement and tagged Computerized Exoskeleton, Exoskeleton, Maker Movement, ReWalk, Wearable technology, Wearables, Wired on July 28, 2014 by The Atmel Team.